A good friend of mine in Sydney recently relayed a story I have heard many times over. Yes it involves buying a car and yes the experience was less than ideal to say the least….. This particular story comes down to three underlying emotions – fear, trust and anger. When the car was finally ready for delivery, my friend’s wife went to pick it up and noticed the highlight was red rather than white. When she mentioned this to the sales representative he suggested she had requested the red rather than the white. I guess this is often where many customer service problems begin – mis-communications…. Unfortunately this is also where the emotions kick into gear. Perhaps out of fear (loss of commission, loss of job, loss of face) the sales person stupidly persisted with the suggestion that this customer (my friend’s wife) had made the mistake and essentially it was up to her to cover the cost of any changes. The customer understandability did not respond well to being told she made the mistake – there was an immediate loss of trust. This always leads to anger and frustration on the part of the customer. This is where the death from a thousand cuts begins. Many people take the attitude that its just one customer with one problem, it will just go away. When emotions are involved things don’t just go away they are remembered vividly and recalled often. This customer will never have a good thing to say about this dealership for the rest of her life. She will actively recommend against going there to her circle of influence. In the future the dealership will miss out on business not only from this one customer but the many customers she and her husband influence. All this for a few hundred dollars on the part of the dealership to make things right. It’s obvious you have to think of this as a marketing investment rather than a customer service cost. 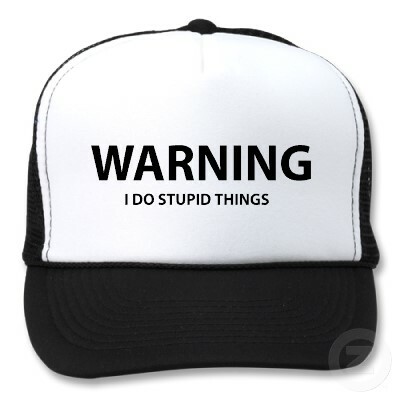 As a leader at your organization what are you doing to make sure your people are not doing “stupid things” to customers? Do you have the type of culture that reinforces the lifetime value of customers? This entry was posted in Customer Centric Values, Customer Experience, Empathy, Market Culture Inaction, Trust, Uncategorized. Bookmark the permalink.